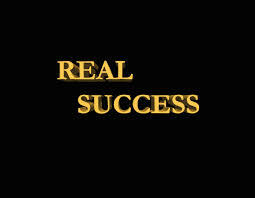 What is real success? Some say the accomplishment of a goal. Others say a healthy life. Others a caring family. Than others add financial independence, recognition from one’s peers, or the power to do whatever you want. Yet what does God say real success is? Is real success something you make happen or is it a gift? Like teenagers sowing their wild oats is how humanity generally functions with God. We are the prodigal child or the son who remains home (Luke 15:11-32). We believe we need to venture out and satisfy all our internal desires. Or we need to stay home and live by all the rules. In so doing we believe we shall become successful. Yet for most, only through the trials, tests, and challenges that this life takes us through do we eventually realize that Father God has a better way to live. Only then do we repent, return, and seek after God. Without God, we try to imitate success. We wear high fashion cloths. We sell our soul for work that pays the most money. We buy material goods that we believe will make us more satisfied. We play extreme sports to battle the demons of fear. We hang around people who we label as successful. We more or less pursue the outer trappings of success. But we fail to capture the real success that comes from the inside-out through His grace. Real success is grace-based. It’s not earned, stolen, or passed on from others. Real success is a gift from God. It is being the recipient of His Grace. As we acknowledge, accept, and act upon His grace, we experience the fruit of real success. Real success is an inner quality that manifests itself through external showings. We may at times be easily fooled through external showings, but the heart is the foundation of the soul. When the heart is a conduit of God’s Spirit, the fruit is real. Real success is allowing God to live in you, with you, and through you. It is the result of submitting to Him. It is accepting Jesus as Lord and Savior. It is becoming one with Him. As we become one with Him, we learn to live in Him, with Him, and through Him. It is a personal, covenant marriage relationship between you and the Eternal. As we walk with Him, we become the recipient of His divine nature. He showers us with His character. The fruit of His Spirit (love, joy, peace, patience, goodness, kindness, gentleness, faithfulness, and self-control: Gal 5:22) empowers us. We become more like Him as a child becomes more like their parent. We learn to live life from a grace-based foundation instead of a performance model. We begin to experience the fruit of salvation. We live in freedom. Instead of trying to make ourselves feel good through our activities, we learn to rest in Christ. Instead of viewing life only through our eyes, we see life also through the heart of our Maker. What we learn by walking with God, we share with others. We want all to experience real success as God intended mankind to have since the beginning of time. Real success is God’s work, not ours. The earlier we learn that, the quicker we experience the genuine fruit of real success.